At that point, the nightmare started, with me running around and trying to find some common carrier that could ship my guns and holster home to me, as it was too late to check it into luggage. Cue people who can’t help with directions, cell phone that won’t complete my searches and general frustration. How did I know it was a Sideguard holster? I couldn’t feel the weight or the bulk of the 1911 at all until I leaned against it. 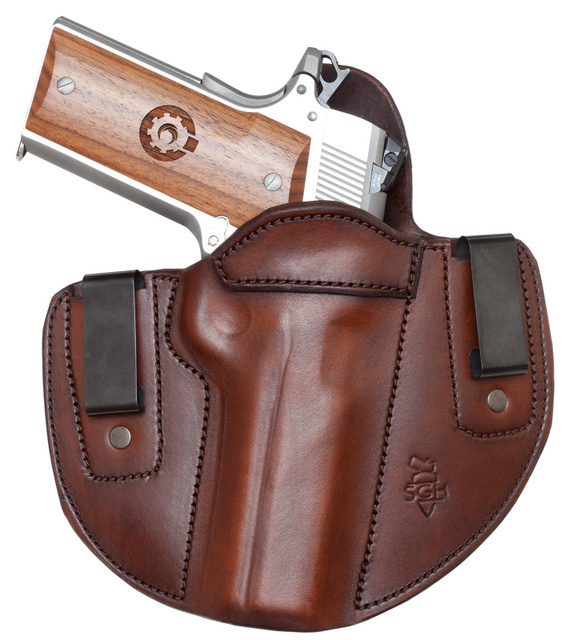 That’s what Eric Srigley’s leatherwork is known for, amazing support and comfort. He’s not the only craftsman and designer of that quality, but my mind associates “comfort” with his holsters in particular. Sad but not surprising that TSA is on the roster of unresolved problems undergoing background processing. I wonder if they or some things like them will always be with humanity, like taxes and herpes…or could some vaccine be developed eventually? 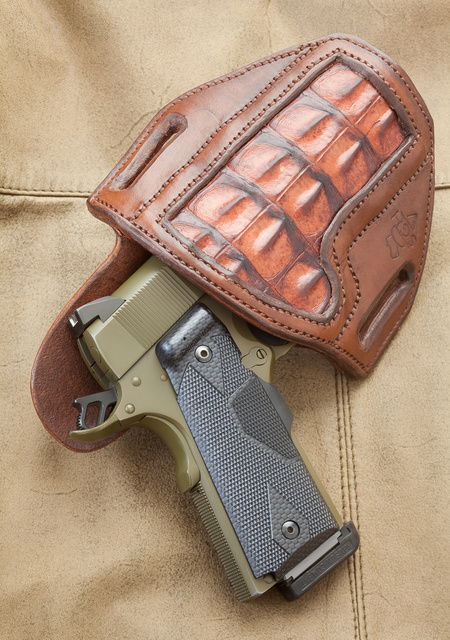 This entry was posted in holster, weapon and tagged 1911, 45ACP, leather. Bookmark the permalink. There’s no vaccine, but treatments exist. The problem is that so many people would consider applying them unethical. When my dreams involve guns, it’s always in great detail too. Might be related to my degree in Professional Gunsmithing. I had a similar experience on my last flight, but with my pocket knife. I am so used to wearing it that I did not realize it was still clipped to my waist band until I was stripping my pockets for the TSA checkpoint. It was too late to retrieve my checked luggage, there was no way to mail it to myself, and I was not about to miss my flight home after a week long business trip. I was not a happy camper, but at least the TSA minion was calm and polite as he escorted me out of the secure area. I hope the US Airways baggage clerk likes his new pocket knife. I’ve adopted the rule Neil Smith advocated a while back: no more flying so long as airlines remain constitution-free zones.